This post was written in exchange for free product at Tropical Smoothie Cafe; however, all opinions are my own. Now that little man is old enough to be able to eat just about anything, I have thoroughly enjoyed introducing him to new foods, flavors and textures. When we first began introducing solids, it was my goal to ensure that he was eating nutrient rich, healthy foods from the get go. As we've moved into the days of summer heat and all the ice cream and popsicle goodness that comes along with it, I've sought out ways for us to indulge in all the refreshing and delicious snacks, without all the sugar. 1) Smoothies. We have these at least a few times each week. The nice part about smoothies is that they are refreshing and hydrating and you can fill them with pretty much whatever goodness you'd like. 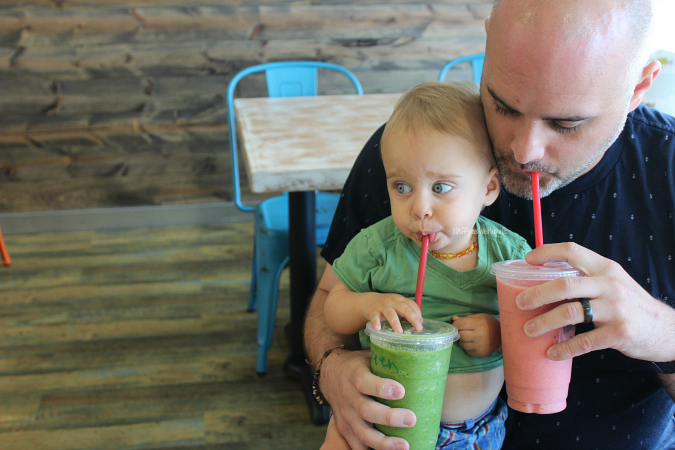 Sometimes we share smoothies at home, or if we are up for an outing, we will head to our local Tropical Smoothie Cafe for a tasty treat. They have so many delicious flavors full of a variety of superfood options. 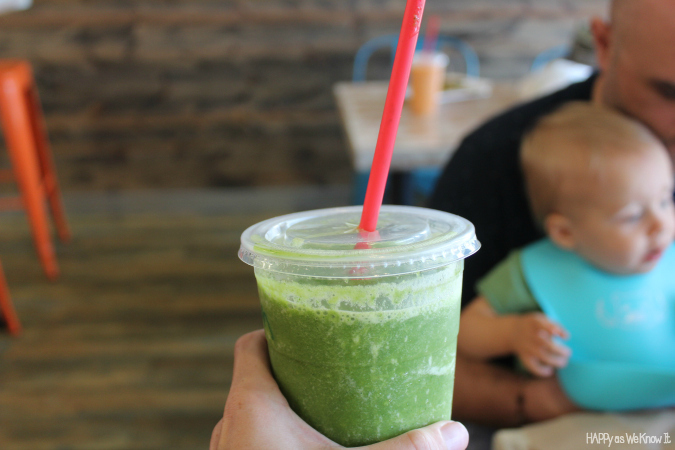 Our favorite is the Island Green made with Spinach, Kale, Pineapple and Banana. This kid just can't get enough of it. 2) DIY Popsicles. Another treat little man loves, especially when he is teething, are popsicles. We love making our own with frozen ice cubes of whatever fruit or veggie we have on hand. Simply puree whatever it is you'd like to use and freeze. We put ours into a mesh feeder for him to devour, but there are several different types of popsicle molds out there as well if you prefer to use those. 3) Fruit. Take your pick with this savory, summer delight. Asher's favorite are blueberries, strawberries, kiwi and pineapple. Always a great and easy choice. 4) Steamed Veggies (Chilled). I try my best to always have steamed veggies on hand in our refrigerator. I make them once or twice a week in a big batch and then am able to readily grab them for snacks or lunches quickly and easily when needed. I often just throw a bit of sea salt on them and they are ready to go. No need to even warm them up! 5) DIY Go Gurt. The real deal has added sugar amongst other ingredients that aren't really all that "real of a deal". I found this idea for creating your own "Go Gurt" that I just adore. You can truly combine whatever fruits and veggies you'd like, and if you have a little one that doesn't do dairy - you could certainly swap out coconut milk yogurt for the original as well. 6) _______sauce in a reusable pouch. Insert whatever word your like to start of this one - apple, pear, sweet potato, a combo pack; you name it. If you've read some of my previous posts on feeding the little guy, you know my love for reusable pouches. A) They are planet friendly, and B) they make on-the-go snacking a breeze. Have some ready to go in your fridge with your child's favorite _____sauce for an easy, cool treat on the way out the door. Whether it be a fresh-chilled smoothie from Tropical Smoothie Cafe or just a good ole' fashioned blend of cut up straw- and blue- berries, there are a multitude of ways to beat the heat with a healthier treat for both you and your little one this summer. 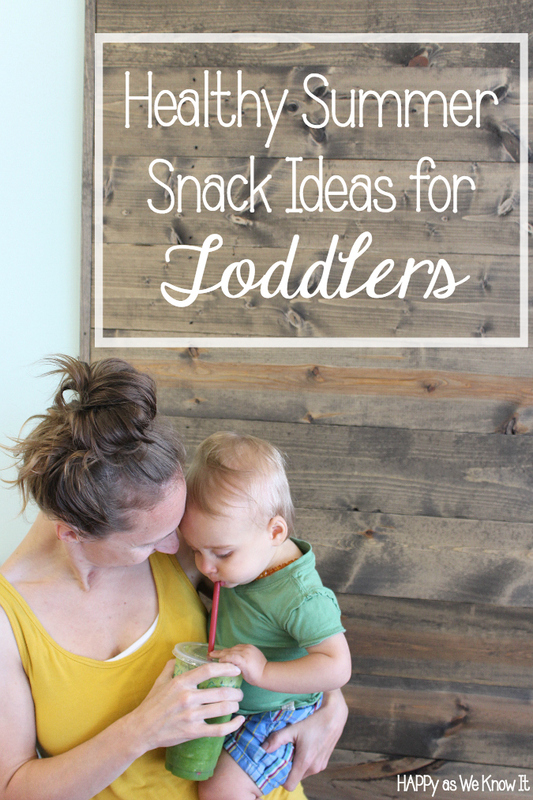 What are some of your toddler's favorite summertime snacks?